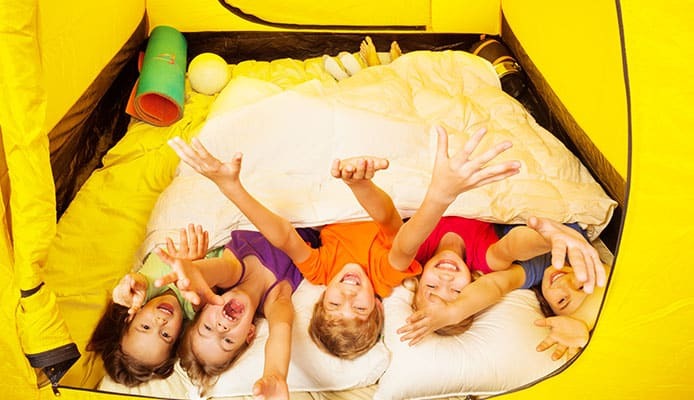 When you start preparing for your camping trip, you will certainly think about the sleeping arrangement. However, you often concentrate on other things and a pillow doesn’t immediately to mind. But if you choose to add one to your setup, your comfort level will be increased significantly. A good pillow holds your head and neck in the right position so you can wake up refreshed and without pain. This is a big plus when camping – you want to have as much energy as possible for all the activities that await during the day. These pillows are not like the ones you have at home – they have been designed differently to suit camping conditions better. For this reason they are made to be compact (especially when packed), very light and easy to take with you. 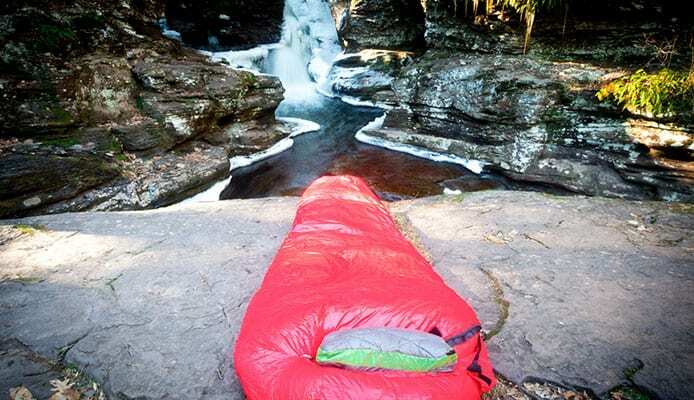 There are a few different design options to choose from, but finding the best camping pillow depends on your sleeping habits and preferences, in addition to the quality of the pillow itself. Take a look at some great camp pillows we selected for you. Also, be sure not to miss the buying guide below, where we will give you some pointers so you can choose easily. 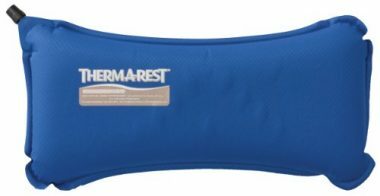 This wonderful product from Therm-a-Rest is highly compressible and gives you great comfort with its soft foam filling. It’s a top rated backpacking pillow, made in the USA. The cover is made from brushed polyester which feels very nice on your face. The bag in which you pack it is built into the pillow case – you just compress it and then tighten the drawstring. You can choose among 4 sizes, ranging from 12x16 inches (smallest) to 16.5x27 (extra large). As for weight, it ranges from 7 to 15oz depending on the size you get. There are 8 colors available, so you can easily match it with your sleeping bag or camping blanket. It’s really well made, and can expand and compress many times without trouble. If you’re looking to save space and want an inflatable pillow, this is a great choice. It’s very compact when packed, measuring only 5x2 inches. When it’s time to use it, you can inflate it quickly with just a few breaths. It grows to a size of 16x12x4 inches, which nicely supports your head when you lay on it. It’s made from TPU and polyester, which make it both strong and comfortable. It has an ergonomic shape, which will keep your neck properly positioned and your head in the middle of the pillow without slipping. When it’s time to pack, just release the valve and it deflates very fast. It comes in a nice storage bag, and the total weight is only 2.75oz. You can get it in eight different colors, and if there is something wrong with the product Trekology will solve the problem quickly. This is a compressible pillow with a slightly different design. It’s filled with soft fiber and has a polyester shell. In addition, it comes with a removable casing too. It’s made of flannel, double brushed and feels very soft and fluffy. The casing can be safely washed in a machine when it gets dirty. The pillow comes with a sack to stuff it in when you roll it, and a barrel-lock to secure it. As for size, it measures 12x18 inches which is pretty similar to most other products we reviewed. However, at 10oz, it weighs more (compared to inflatable pillows of the same size). If you like this one, you can choose between four different color patterns. 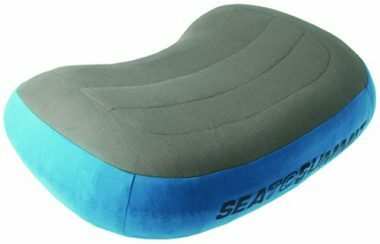 It’s a high quality product which will give you great support, and you can use it as a lumbar pillow too. Here we have a versatile product which can be more than handy when you go camping. 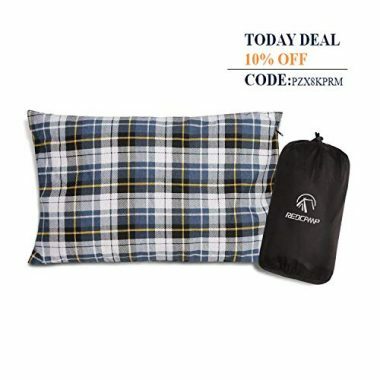 While it can certainly be used for sleeping, it’s primarily designed as a lumbar support pillow when sitting, making it a fantastic addition to your camping chair. It has a self-inflating mechanism so you don’t have to blow it up, and the valve allows you to control firmness. Furthermore, it has an additional Dia-Cut foam layer for increased comfort. The outer layer is made of polyester, which has a nice feel and also won’t tear easily. It measures 7x14 inches, with a thickness of 3 inches when inflated. Because of the shape, it will give you excellent support and relieve pressure points. The size of this pillow when packed is no bigger than a soda can, and with the weight of just 4oz you really won’t have a problem to take it anywhere. However, keep in mind that it’s not machine washable, and that if you need to clean it, it’s best to do it by hand. The Aeros is a hybrid pillow which has an inflatable TPU bladder with an addition of a synthetic fill layer, to make it softer and nicer to sleep on. This way you get both comfort and adjustable firmness. The outer layer is made from 50D polyester which is brushed for a nicer feel. 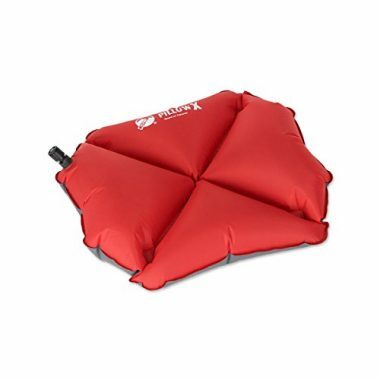 It features a special three-way valve, which doesn’t leak when inflating, and has two options for deflating – releasing small amounts of air, or releasing it all at once when you want to pack it. It comes in blue and green color, while the top surface is grey on both. There are two sizes available, depending on how much space you have. The smaller one weighs 3.2oz while the larger one is 4.2oz. No matter which size you choose, both have an ergonomic shape. It follows the contours of your head, neck and shoulders to distribute pressure evenly. Finally, it’s very stable and doesn’t move around when you sleep. This is a pillow which resembles those that we use at home. 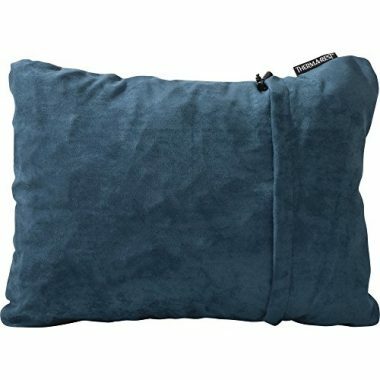 It’s a non-inflatable, compressible pillow filled with memory foam (CertiPUR-US certified). It’s a bit larger than other hiking pillows, measuring 19x14”, but we say it’s worth it for the added comfort. It comes with a breathable cover, made from a mixture of viscose rayon and polyester. Thermal regulation of this pillow is excellent, and in addition to this, it’s hypoallergenic and dust mite resistant. The product comes in a nice stuff sack to save your space. When packed, it measures just 10x6 inches which is great for this type of pillow. The weight of 36oz is not exactly featherlight, but that is the price of added comfort. It’s completely safe to wash it in a machine and put it in a dryer, but be sure to use cold water and dry on low. It’s really well made, and comes with a 5-year warranty. In addition, you can buy a waterproof cover for this pillow from the same manufacturer (if you need one). 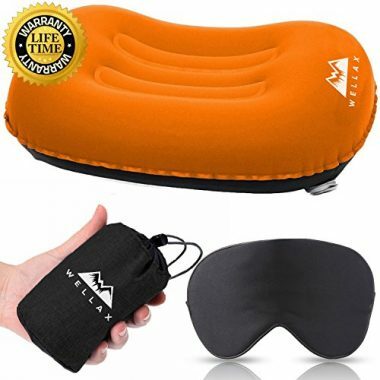 The WellaX pillow is an ergonomic inflatable pillow which is extremely compact. It’s very popular among campers, and for a good reason. For an affordable price you get an excellent quality product which measures 16x12x4 inches when fully inflated. Materials used are nylon and TPU, so this pillow won’t tear easily. Manufacturer claims that it’s water and heat resistant, which is a bonus because of unpredictable circumstances. It has an efficient valve which allows you to inflate and deflate it in seconds. Like other inflatable pillows, you can adjust firmness, so it’s a good choice for all types of sleepers. The size when packed is 5x2 inches, with weight of only 2.75oz. Also, it comes with a neat little bag to put it in. Finally, Chillax includes a sleeping mask as a gift with this purchase. It’s made of silk, very comfy and more than useful to get a couple more hours of sleep when the sun rises in the morning. Here we have a nice and compact pillow which is praised by many users. It isn’t inflatable, but instead is filled with spun cotton. The case is made of flannel, and can be removed to wash. You will have enough head space on this pillow, because it’s a bit wider than usual – 20x12 inches. Redcamp gives you a bag with the purchase, so you can stuff it in and compress it to 11x6 inches. Considering the design, it’s fairly lightweight – only 11.2oz. The product has a 1-year warranty, and you can even get your money back if you order it and you don’t like it. There is also an option of ordering two pillows for a reduced price. Pillow X is unlike other air pillows for camping we talked about so far, and this design is an advantage. The X-shaped grooves will stabilize your head and keep it in a proper position, with reduced pressure to your neck. Material of choice is polyester – soft 30D on top, and strong 75D polyester on the bottom side. It’s certainly the lightest product on our list, weighing just 1.95oz. When fully inflated, the dimensions are 15x11x4 inches, and in addition to sleeping it serves as an excellent seat cushion too. Finally, Klymit gives you a limited lifetime warranty if you encounter problems. Even though it’s inflatable, this one is designed to be very comfy too. It features a self-inflating system, which means you don’t have to blow it up yourself. Just unscrew the valve and leave it to inflate. It takes a few minutes to fully inflate, but it’s very firm when the process is over so you don’t have to worry. There are two options you can choose from – an organic cotton top (blue) or a microfiber top (orange). Both feel very nice, but regardless of which one you choose you can’t wash this pillow in a machine. It’s recommended that you just wipe it with a wet cloth when it gets dirty. The bottom is made from a different material which prevents slipping. 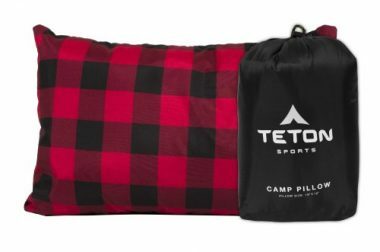 It’s about the usual size as other camping pillows – 18x10x4 inches. Manufacturer packs it in a nylon sack so you can easily carry it. It’s a great little pillow, definitely worth considering. When you set out to buy a new camping pillow, good support and comfort are most important to consider. This determines how rested you are going to be in the morning. However, this isn’t something universal – what’s great for me isn’t necessarily going to work for you if we have different sleeping habits. 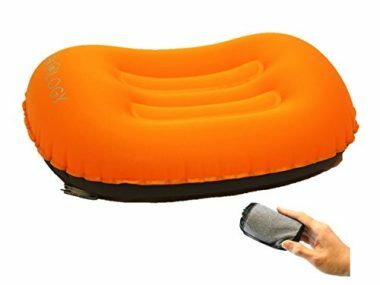 In addition to this, portability, small size and light weight must be considered too (since we are talking about best camping pillows). Take a look. Three types of pillows are most commonly used on camping trips: compressible, inflatable and hybrid (a mix of the previous two). Depending on whether you like a softer or a firmer pillow, as well as how much space you have in your backpack, one type can prove to be a better choice over the other. A compressible pillow is very similar to pillows we have at home. It can be filled with down or synthetic materials (like foam) and feels really nice and comfy when sleeping on it. However, it won’t give you top-notch support and you won’t be able to adjust it. While it does compress and fold down, the pack is larger than inflatable pillows. For this reason it’s often not the best choice if you are oriented toward saving space. On the other hand, it’s great if you’re looking for added comfort and have some extra space. An inflatable pillow contains a TPU (thermoplastic polyurethane) bladder, which is inflated with air. There are several upsides to this. You can adjust firmness and height of your pillow by adding or releasing small amounts or air from your pillow (creating optimal support). Also, it’s flat when you deflate it so you can easily pack it very tight. In addition to the air bladder, there is another layer on top. It’s made from polyester, nylon or other material and used to make the pillow more comfortable and durable. Finally, a hybrid pillow get’s good features from both of the previously mentioned types. It has an inflatable bladder, meaning you can adjust it to your liking and it doesn’t take up much space. Furthermore, it has a soft layer for increased comfort when sleeping. It was added as an improvement to the rough feel some inflatables have, which isn’t very appealing to users. This layer is usually made of foam, so it can be compressed really well. These are the factors which greatly influence the overall comfort. Your new pillow must be sufficient in size to keep your head in place and give it good support. However, it must remain small enough so it isn’t a burden to take with you. This is a balance manufacturers are looking for. 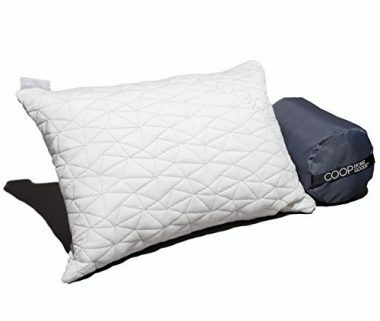 As you had the opportunity to see, we featured both small and large pillows in our camping pillow reviews, so you have plenty of options. When it comes to shape, many manufacturers design their products ergonomically. Whether we use a sleeping bag or sleep on a sleeping pad in a tent, we already have limited space. Properly shaped pillow will keep your head and neck in line with your spine, distributing pressure properly and allowing you to relax. So, it’s certainly a bonus to get an ergonomic pillow for camping. Your new pillow must give you proper support, otherwise you might as well be sleeping on a pile of clothes, there won’t be any difference. Not all of us sleep in the same position – some sleep on their backs, others on their stomachs while some sleep on their side. If you are a stomach sleeper, your head doesn’t require much support to keep it in proper position. Because of this, stomach sleepers need and often use a thin pillow. On the other hand, side sleepers need a thick pillow so their neck is in a straight line and their head doesn’t hang. If you are in the third group (back sleepers), you need something in between for good support – neither too thin nor too thick. These are general guidelines, but it still comes down to what your personal preferences are. All camping pillows are designed with weight in mind. You will probably be bringing a camping tent and other equipment which will already weigh you down, and you don’t want a pillow contributing to that any more than it needs to. Manufacturers are oriented towards making the lightest pillow possible which will still have all the features we mentioned. 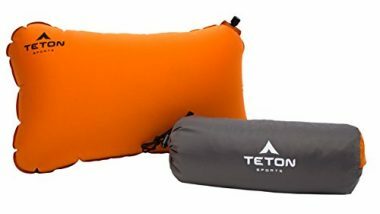 Inflatable camping pillows are generally very light, while non-inflatable products like down or foam-filled pillows can be a bit heavier depending on their size. If you’re going RV or car camping, this really won’t be a problem. However, if you’re looking for the best backpacking pillow at the same time, weight must be considered. Manufacturers use various materials when making these products, to make them more durable and comfortable. Natural materials (cotton, flannel) in combination with down camping pillows have the highest level of comfort and breathability. This is a big plus if you get hot and sweaty when you sleep – it will make you night much better. On the other hand, inflatable pillows won’t allow any air circulation. However, they often come with some type of material (cotton, microfiber, polyester or other) on top to increase comfort. As we mentioned, it should seamlessly fit it your backpack. Many of these pillows are similarly sized to a soda can. When you decide to unfold them, you should do so with ease. Compressible pillows should open and fluff up mostly on their own (with a little help). Inflatable pillows should have a high-quality valve which will allow you to blow the pillow up quickly and hold the air inside without leaking. Some valves allow you to release small amounts of air to finely adjust firmness. When it’s time to go home, you should be able to pack your pillow quickly – whether it’s rolling and compressing your pillow back into the sack, or releasing the air out before you fold it. If you are concerned about this, you should take a look at user experiences and see how the pillow performed. Q: How To Wash A Camping Pillow? A: Pillow hygiene is very important. You need to clean it from time to time to keep it safe for use, and avoid bad smells from dirt and sweat. Washing depends on the type of pillow you get. If you have a compressible foam-filled pillow, there is a large chance it’s perfectly safe to be put in a machine. Some manufacturers even recommend washing in a machine and drying in a dryer because the pillow gets even fluffier afterwards. However, be sure to always check the label. If you have an inflatable pillow, the process is a bit different. Your pillow may come with a case which can be taken off and put into the washer without problem. It’s not recommended to put the pillow itself into a machine because the air bladder can get damaged. In that case it’s best to wash it by hand. Use warm water and a mild detergent, scrub it, rinse it with clean water and leave in the air to dry before storing it. Q: How To Store A Camping Pillow? A: Make sure your pillow is completely dry when storing it, whether you’ve just washed it or after using it, because you want to avoid mold and bad smells. Similar to sleeping bag storage, it’s best that you don’t fold your pillow tightly, but leave it unfolded. If you have an inflatable, you can also leave the valve open. Be sure to save the instruction manual and follow the instructions on storage (if there are any), so the product can last for many years. A: These are very similar, and many people consider them to be the same. However, there are some minor differences. For example, pillows made specially for travel are often smaller. They can also have a different ergonomic shape for proper neck support, because they are mainly used for sleeping in a sitting position. Anyway, these differences aren’t that significant and you should use the pillow you like. We featured several products in our list which can be used for any occasion – camping, backpacking or traveling. Q: What Are The Advantages Of A Camping Pillow? A: Compared to sleeping without a pillow there are numerous advantages. You will fall asleep easier, get a pleasant sleep during the night and wake up well rested in the morning. A combination of the best backpacking pillow and a good sleeping pad will prevent an aching body and keep you energized for all the things you plan on doing. A camping pillow can make a big difference in your sleeping experience while outdoors. While it often isn’t top of the list, it’s an excellent addition to your camping gear. As we discussed, pillows come with different design features to match your sleeping preferences, so we’re sure you’ll be able to find the right one. It also makes a great gift for camping enthusiasts, if you’re wondering what to get for your camper friend or family member. Considering that camping pillows aren’t overly expensive either, you should definitely give them a try – you’ll be pleasantly surprised. Have you tried a camping pillow that made it onto our list? Is it comfortable to sleep on? Is it compact and easy to take with you? What about durability? Please share your experience with us in the comment section below.